A Russian actor slapped a member of a chat show audience who criticised her son, who has Down’s syndrome. 49-year-old Evelina Bledans is currently expecting her third child, and appeared on the popular Russian show Live, to talk about having a baby later in life. The movie and theatre actor conceived via IVF, and dreams of having a daughter. At one point during the show, a member of the audience accused the actor of risking her unborn child’s health by getting pregnant at 49. She also criticised her son Semyon, but Evelina was having none of it. Semyon, one of Evelina’s sons, was born with Down’s syndrome. It is dangerous to give birth between the ages of 35 and 40 so what about 49? What were you thinking? Do you want to give birth to another sick child? Will you give birth to another child with Down’s syndrome? Nobody needs such a child, not society and not you. 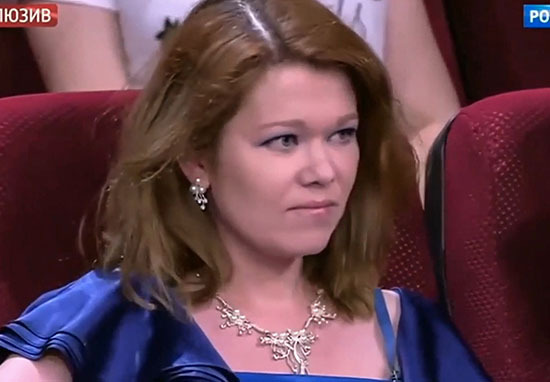 During Lebedeva’s shocking speech, Evelina tried to interrupt her calmly, but the audience member just carried on talking. Seeing as words weren’t going to get through to the woman, the actor got to her feet and cooly strolled over to the Lebedeva. One of the other guests tried to diffuse the tension by telling the woman to leave the studio, but with no avail. After listening to the woman’s awful criticisms about her son, and implications about people who have Down’s syndrome in general, the actor argued back. You wretch, I will smack you! This is for my child, understand? You can say anything about me, but leave my children alone! Evelina’s youngest son, Semyon, who she shares with ex-husband, TV producer Alexander Semin, was born in 2012. Viewers of the show supported the actor, praising her for standing up for her children. @Evelina_Bledans Well done on defending you son, he is lucky to have a Mother like you. Don't stop fighting the bigots.